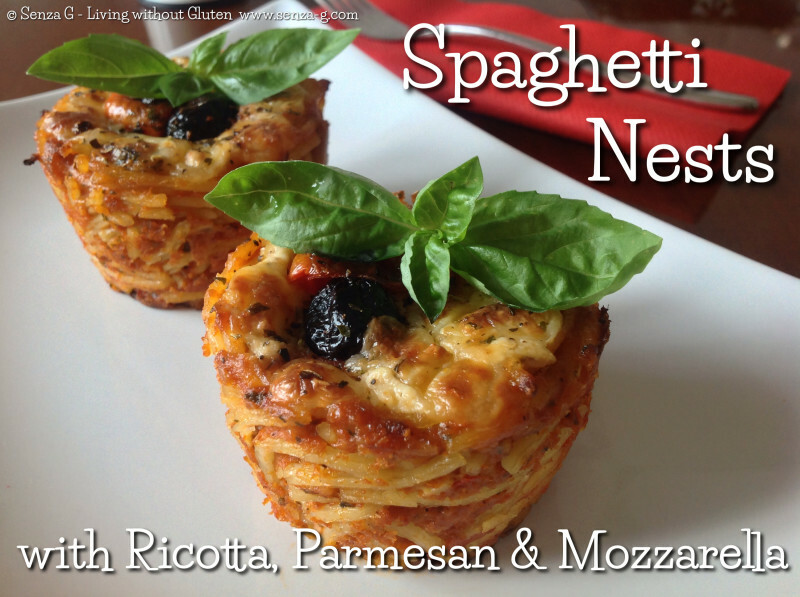 A great way to use leftover spaghetti! This is what I call an ad hoc recipe, therefore, the weights and amounts are not accurate as I was working with what I had left. So please use your judgement. The pasta I had as leftovers was a simple tomato sauce spaghetti. Start by adding the beaten egg to the spaghetti. Kindly note that this also depends on the amount of your leftover spaghetti. As I said above, use your judgement if you feel it requires two eggs. Grease a deep muffin pan with olive oil. I used a silicon one, but I would recommend the traditional metal one as the spaghetti will probably crisp more. Take forkfuls of spaghetti and place in the holes, about 2/3 full. 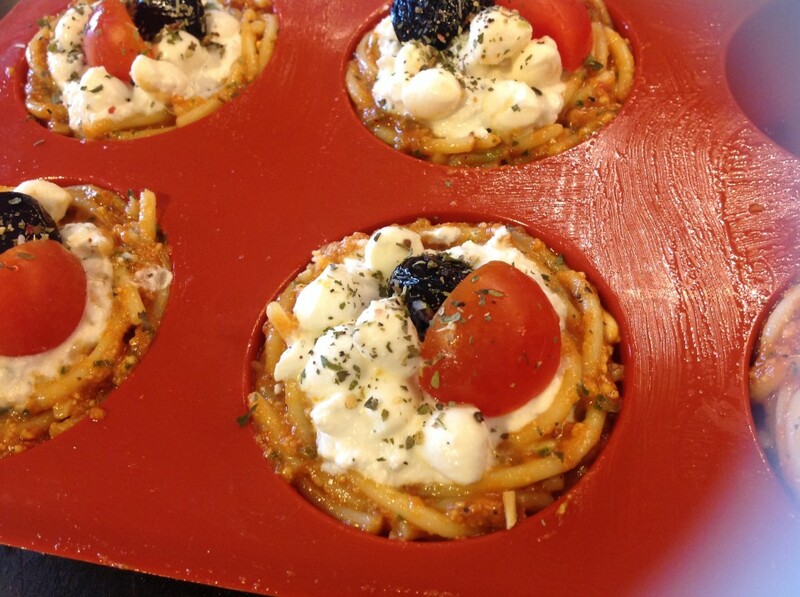 Using a spoon or even your fingers, move the spaghetti up the sides, creating an indentation in the middle. Do the same with the rest. Mix the ricotta with about 1/4 cup of Parmesan cheese, finely chopped basil, season and place a spoonful of this mix in every indentation. * Top with the shredded mozzarella/mozzarella balls. Place a quarter or half a cherry tomato and a black olive and sprinkle with some Italian Herbs. 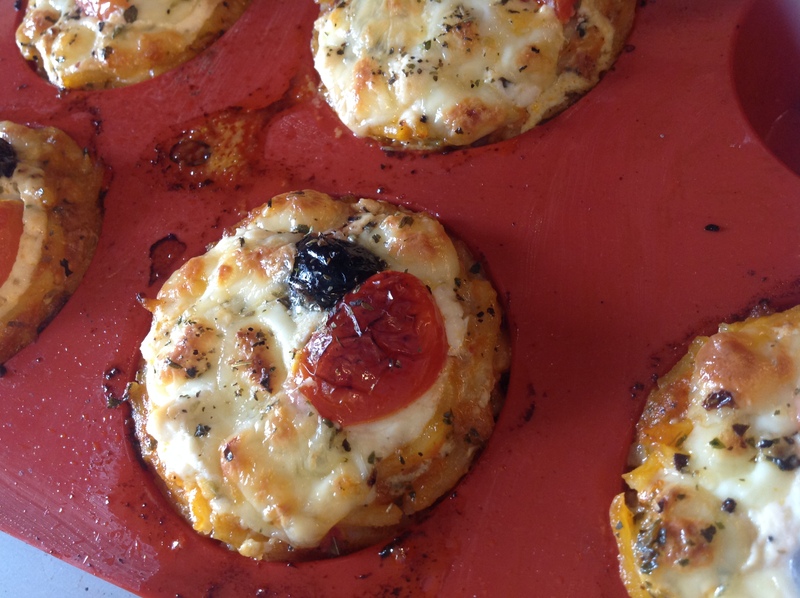 Place in the oven and bake until the cheese melts and browns. Take out of the oven and let cool slightly. 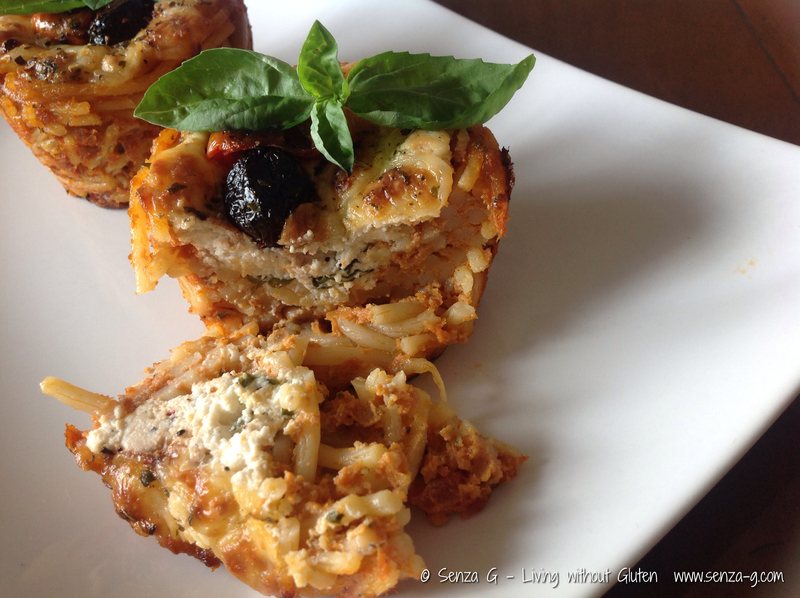 Using a knife, run along each muffin to loosen just in case the spaghetti gets stuck, but if it is non stick you will not have any problems. You can also make these in foil cupcake cases. That is what I will probably do when I make them again. And like this they would make lovely party food. Turn out onto a plate and garnish with fresh basil leaves before serving. * you can also use shredded pizza mozzarella mixed in with the ricotta.